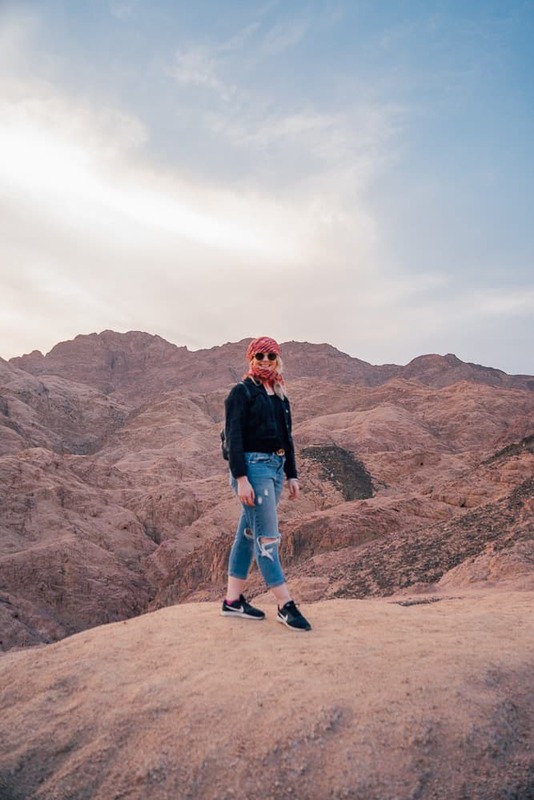 Egypt and Jordan are two countries that have fascinated me for years! 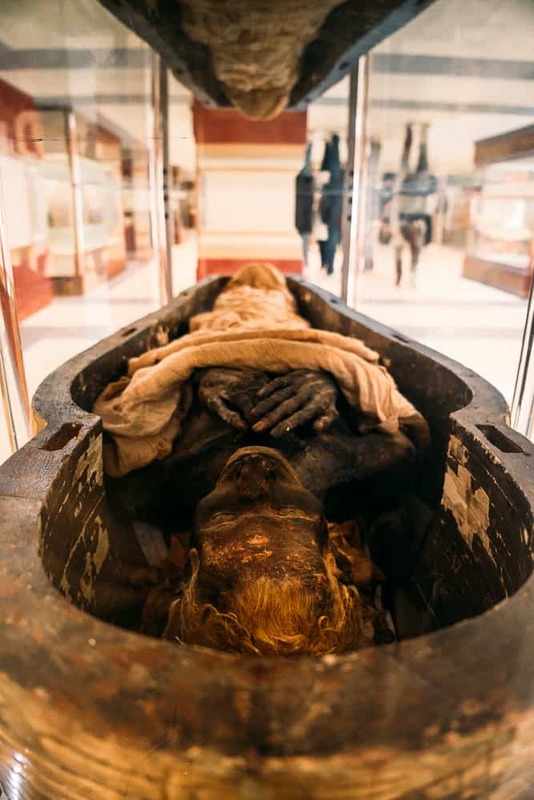 Since watching Hollywood feature films such as The Mummy and countless documentaries on ancient Egyptian history, it’s a whole different level seeing it all in the flesh and by far exceeded all expectations. 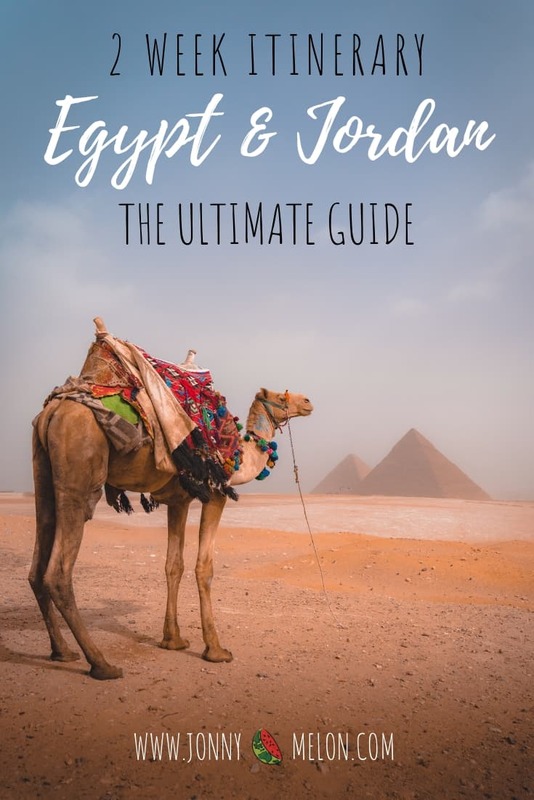 I have put together this 15 Day Egypt and Jordan Itinerary based around my trip with Travel Talk Tours, one of the most reputable tour companies in Europe and the Middle East. I arrived at Cairo International Airport for the beginning of the 15 Day Egypt and Jordan Tour. A driver from Travel Talk was conveniently awaiting my arrival and from here we drove directly to the hotel in Cairo. 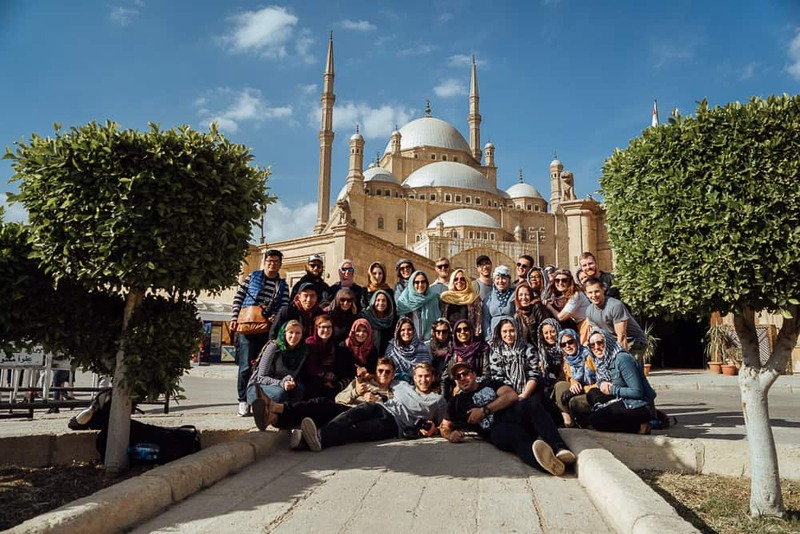 I met the other tour members and our guide for a group briefing of the 15 Egypt and Jordan Tour before we all headed out to a fantastic dinner cruise on the Nile River. 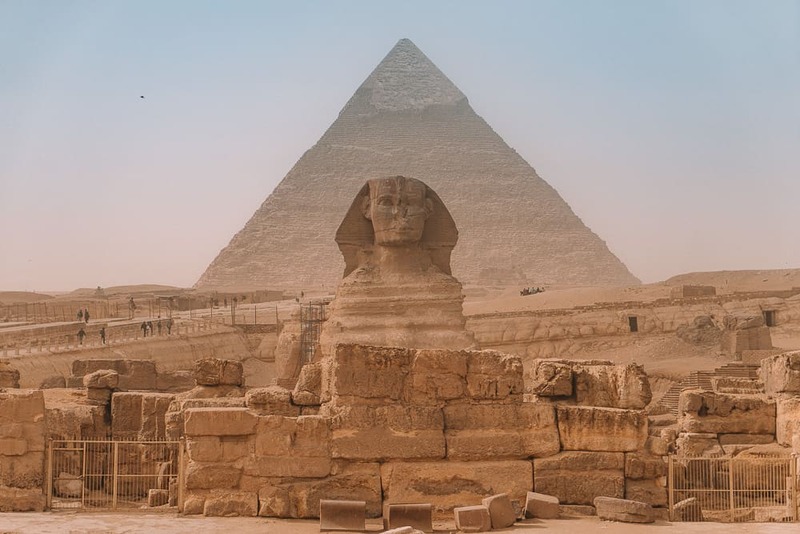 A 7am start to explore the first exciting locations on the Egypt Itinerary, The Great Pyramids Of Giza, Saqqara and the Great Sphinx, all of which reside in the Giza Plateau. The 3 Pyramids Of Giza are Mykerinos, Cheops and Chephren are hands down the most incredible structures I have ever seen in my life. The million dollar question is how were they built and a question that may never be answered. 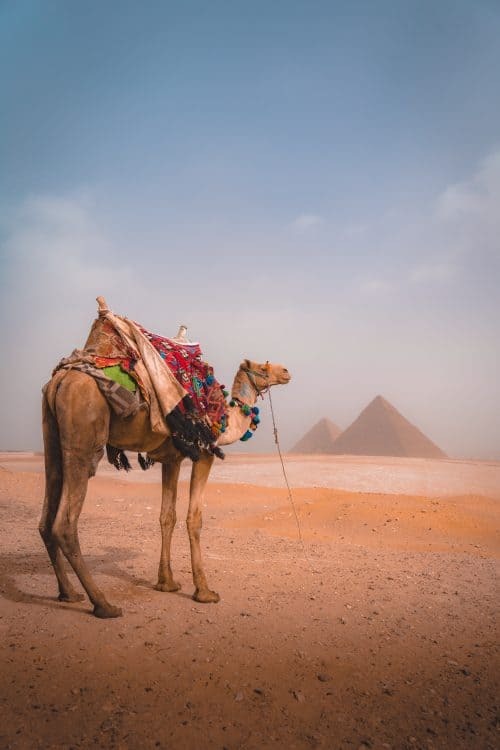 The Great Pyramids of Giza are classed as one of the Seven Wonders of the World, which are now the oldest and the longest surviving archaeological sites in existence. 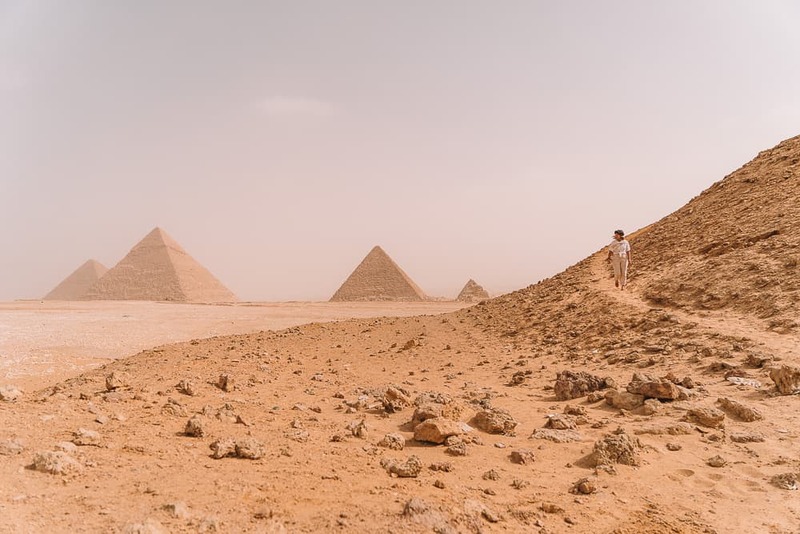 I was left speechless and absolutely mind blown as I wandered around the Giza Plateau. Gazing upon the Great Pyramids with my own eyes was ten times better than I had imagined it to be. 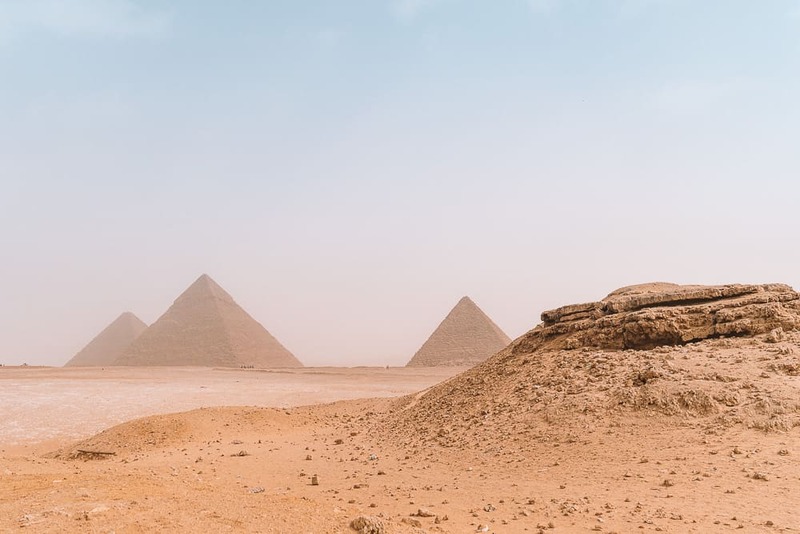 So much history and conspiracy theories lie behind the walls of the Great Pyramids, which are said to have housed the remains of deceased Pharaohs who ruled over ancient Egypt. 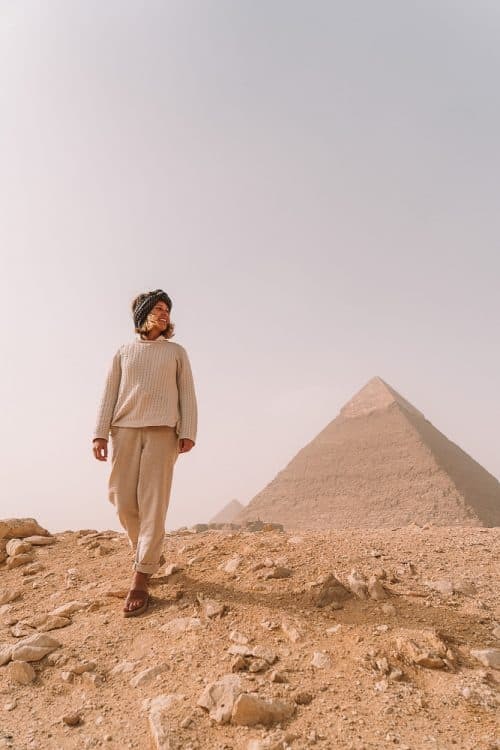 Interesting fact: The construction of the Great Pyramid of Giza would have taken approximately 30 years and 100 thousand men to have conveyed, carved and carefully placed 2.3 million blocks of stone with an average weight of 2.5 tons to complete this perfect pyramid structure. Believe it… or not? 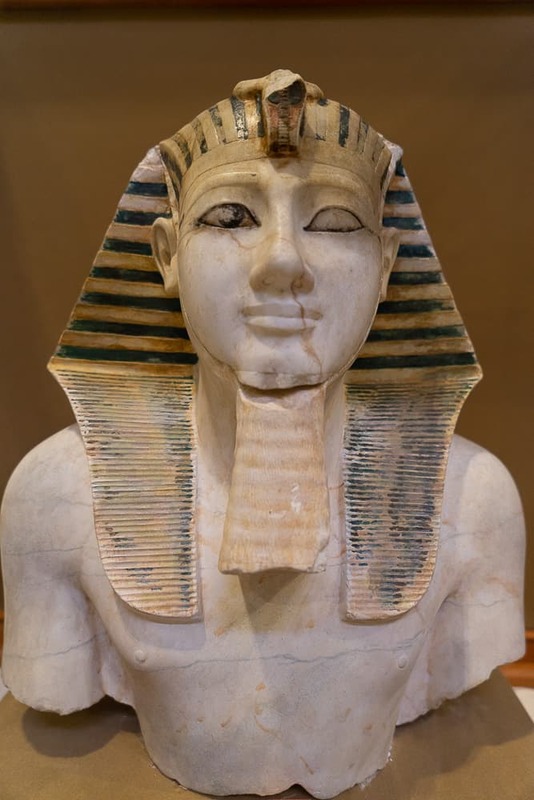 Saqqara is a burial ground in the Giza Plateau and it holds the oldest stone building complex known in history. The stepped Pyramid of Djoser is the most appealing attraction at Saqqara which is also known as the Step Tomb due to its rectangular base. 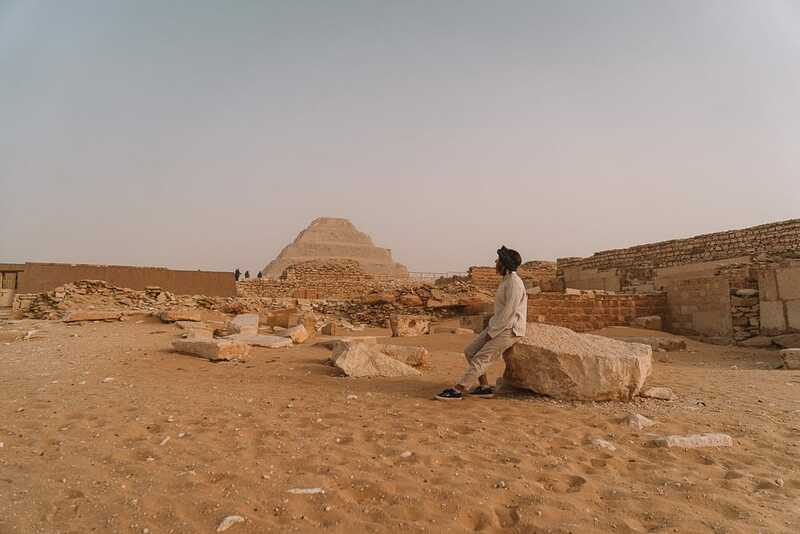 The Step Pyramid was exposed from under the sand in 1924 and it is under constant restoration. 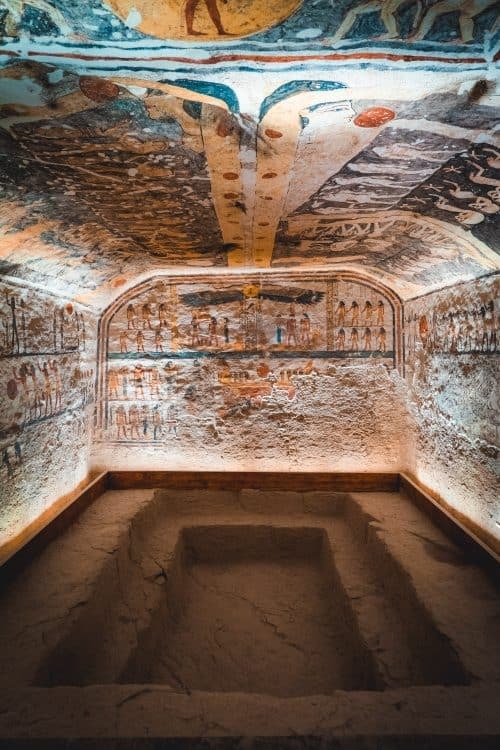 My favourite spot in Saqqara was the funerary complex of Djoser because of its high walls, cubic like structure and the vibrant orange colours throughout. 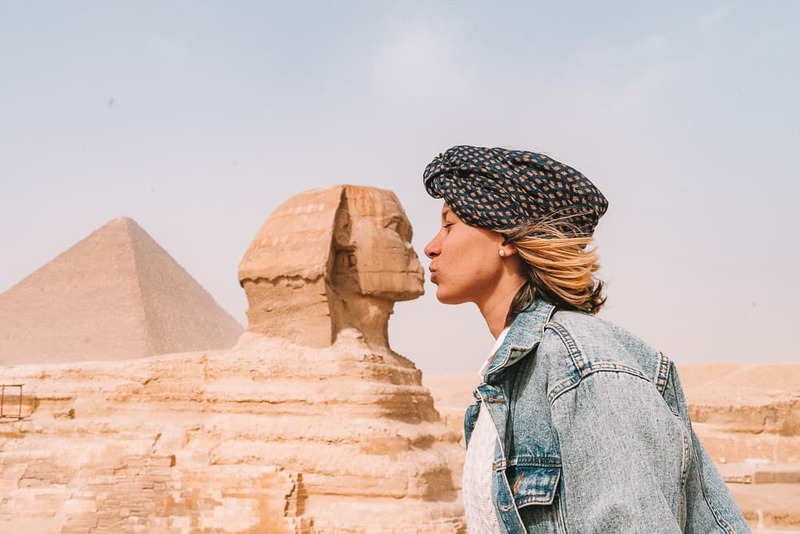 The Great Sphinx of Giza is a mythical creature that has the head of a human and the body of a lion that lies in the Giza Plateau directly in front of the Great Pyramids. The Great Sphinx is mythicised as treacherous and those who cannot answer its riddle suffer a fate of being killed and eaten by the monster. The Great Sphinx was one of my favourite locations to shoot in the Giza Plateau as the head of the Sphinx lines up perfectly in the centre of one of the Great Pyramids. 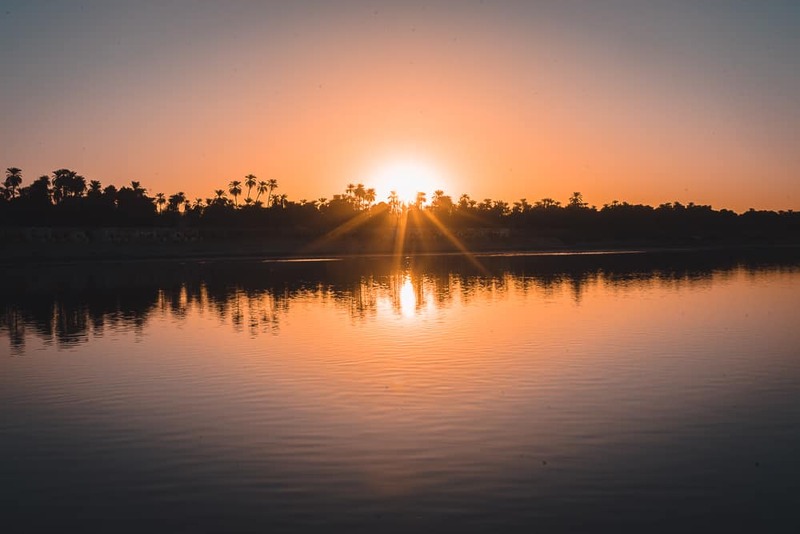 After a full day of exploring the Giza Plateau on day 2 of the Egypt Itinerary, we headed south on the bus for a 10-hour journey to Luxor, arriving at the hotel around midnight. Day 3 on the Egypt Itinerary kicks off with an early start to explore the Karnak Temple Complex in Luxor. 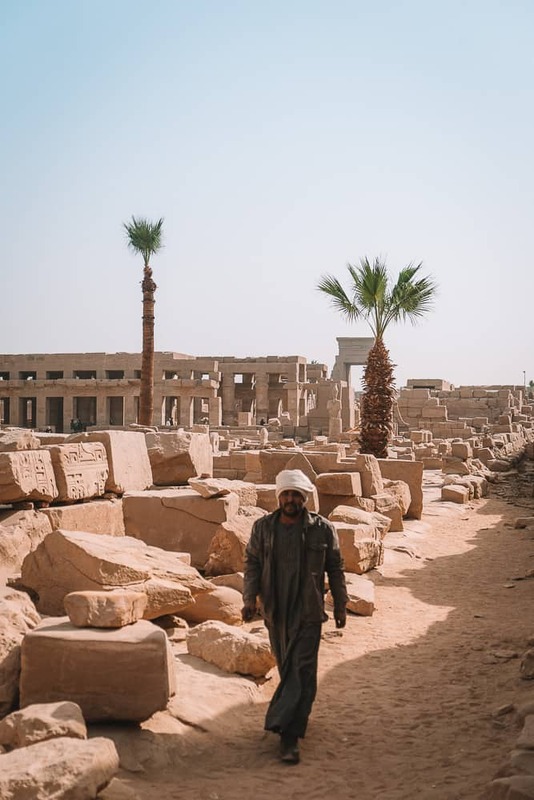 Karnak in Arabic means ‘fortified village’ and the complex is a mix of tall pylons, decayed temple structures and detailed hieroglyphs. 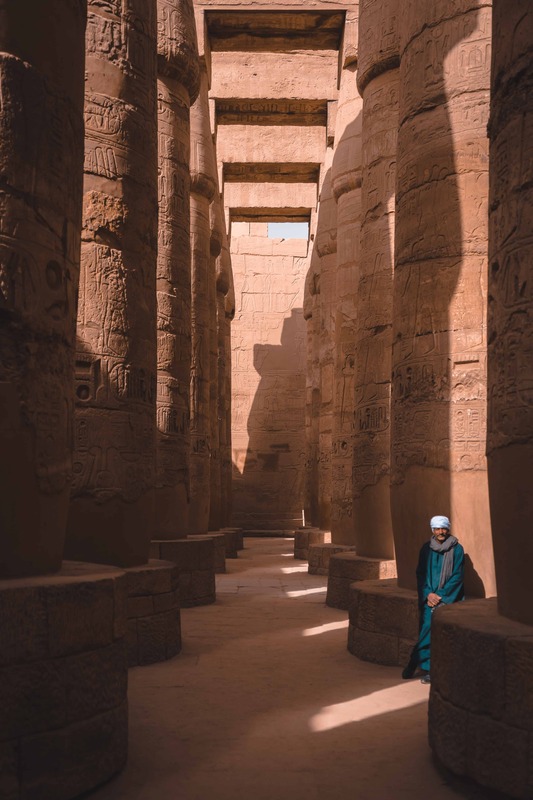 It is said that the Karnak Temple was built by thirty Pharaohs, enabling it to reach a complex size and such diversity that is not seen anywhere else in Egypt. 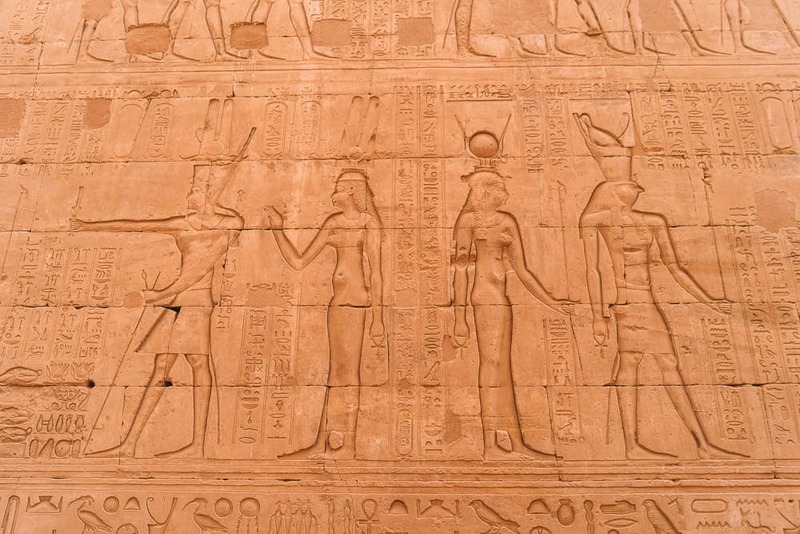 Karnak Temple was also the main place of worship in Theben times. 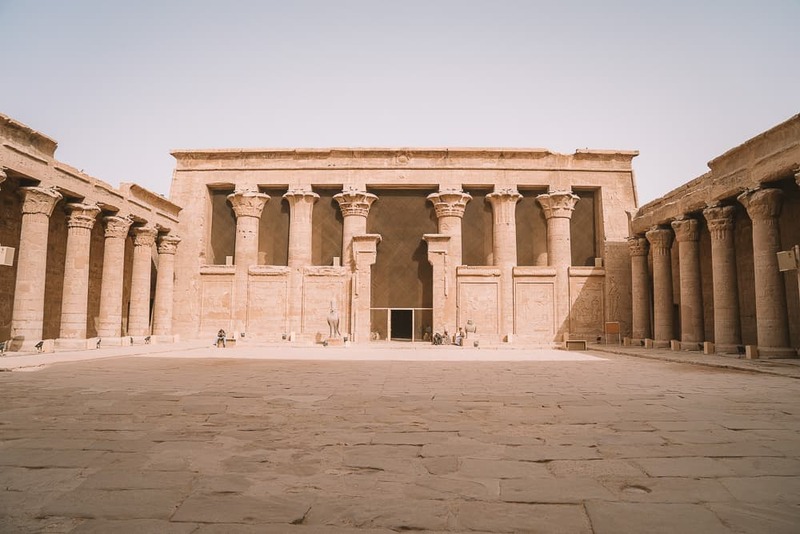 At the heart of the complex, the Temple of Amun dominates the hypostyle hall made up of enormous pylons. The enormity of these pylons are absolutely insane and it makes you question the construction and placement of them all in ancient times. 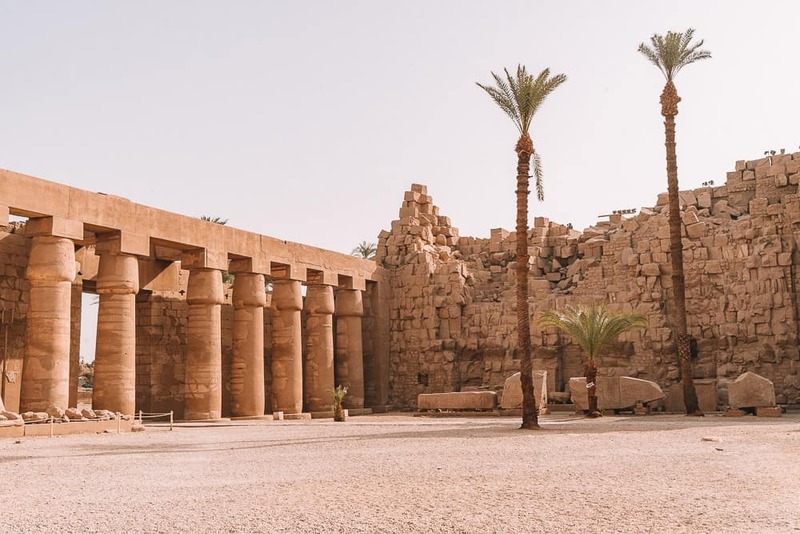 The Karnak Temple was one of my favourite locations to explore in Luxor and it is clear why it is a must-see attraction on the Egypt and Jordan Tours. After exploring the Temple of Karnak in Luxor we stopped into a local restaurant for lunch, which was delicious, before continuing on the bus to Aswan which is the next destination on the Egypt and Jordan Tour. 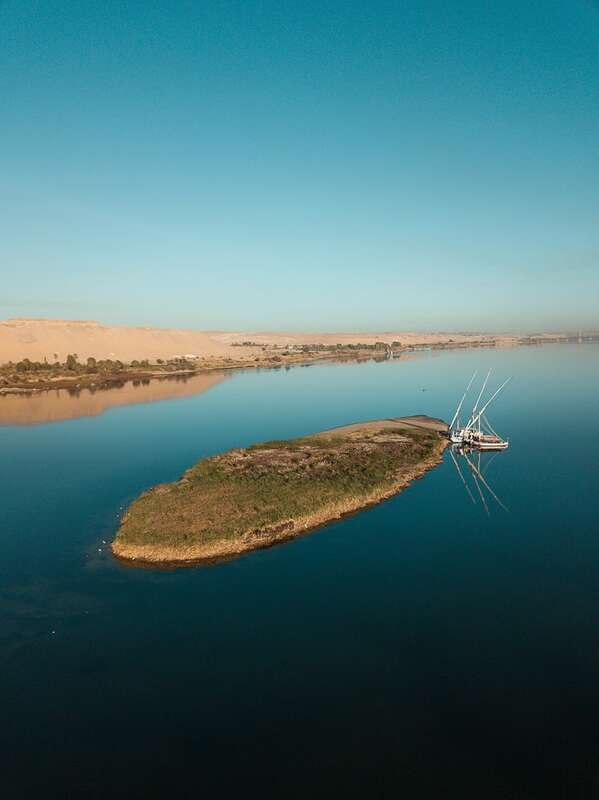 A 4am wake up call to make the 3-hour drive south of Aswan to Abu Simbel. 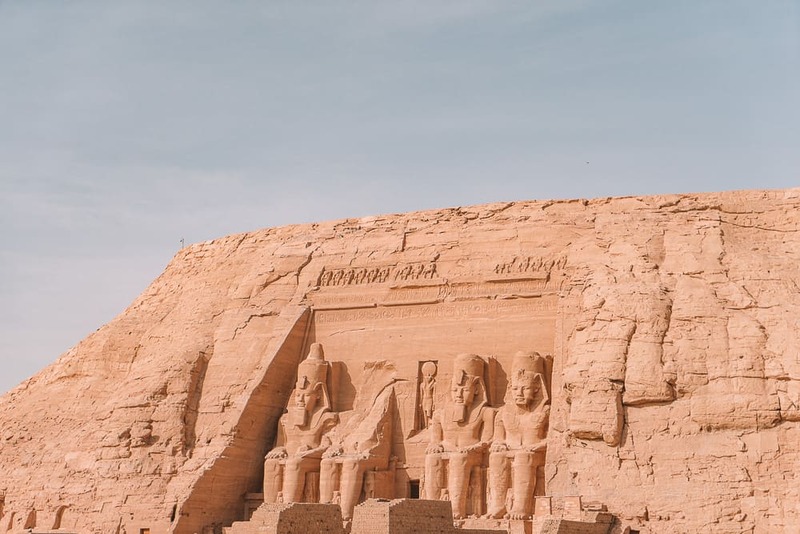 The archaeological site of Abu Simbel is very famous for its two magnificent temple structures that were built by the Egyptian king, Ramses II. 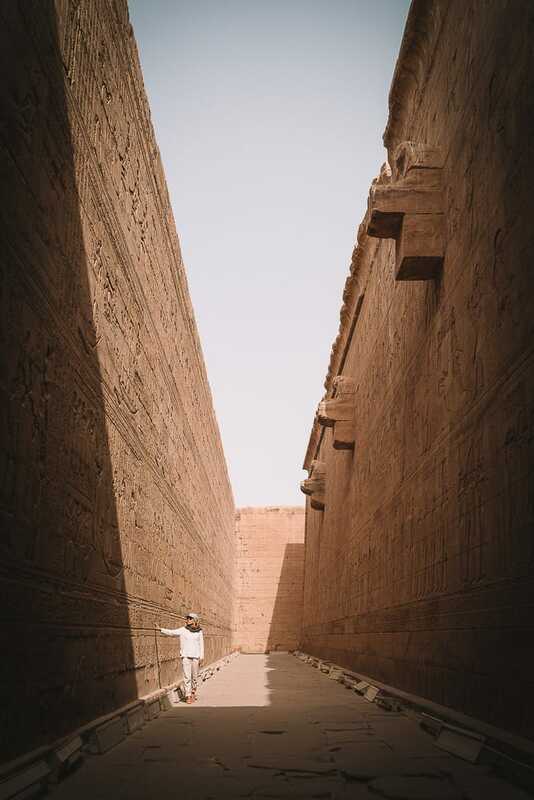 One temple features for statue figures of Ramses that have been carved into the limestone cliff, which was built in dedication to the sun gods, Amon-Re and Re-Horakhte. 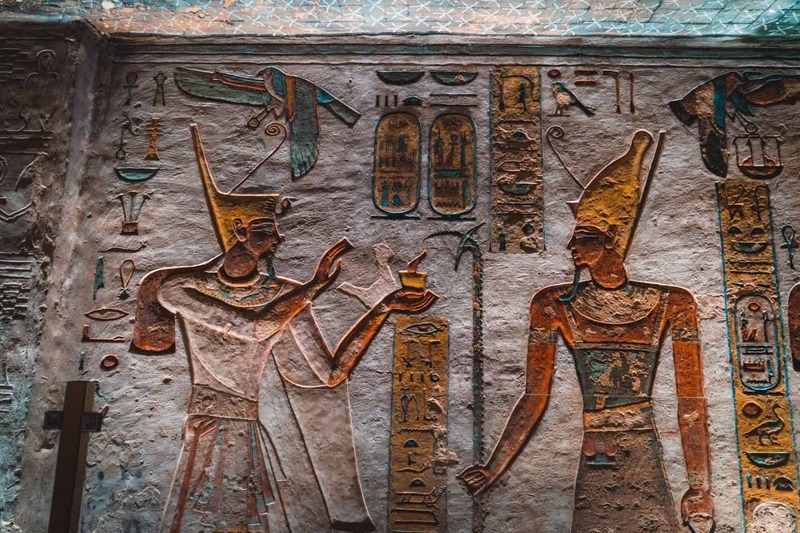 In fact, on two days of the year, February 22nd and October 22nd, the sun penetrates the entire length of the temple and illuminates the shrine in the holy of holies. 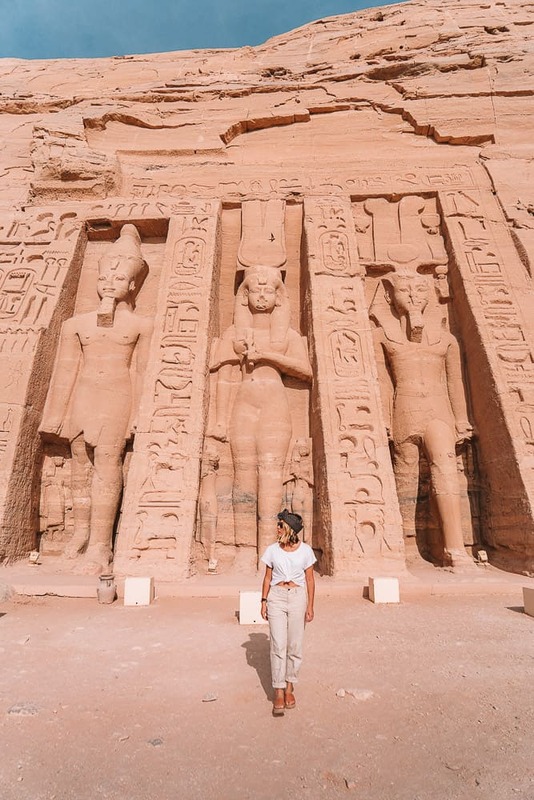 The second temple at Abu Simbel is dedicated to Ramses Queen, Nefertari. The outside of the temple features six carved statues of the Queen and King that stand at 10.5-meters tall. 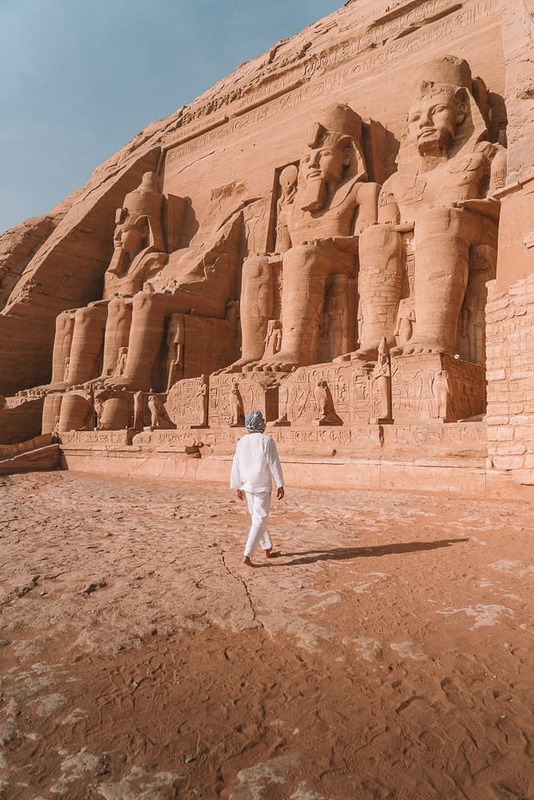 When I was exploring the Abu Simbel complex I couldn’t stop imagining what it would have been like to be present during the ancient Egyptian times. The long and rich history of this country fascinates me more than any other country has before. 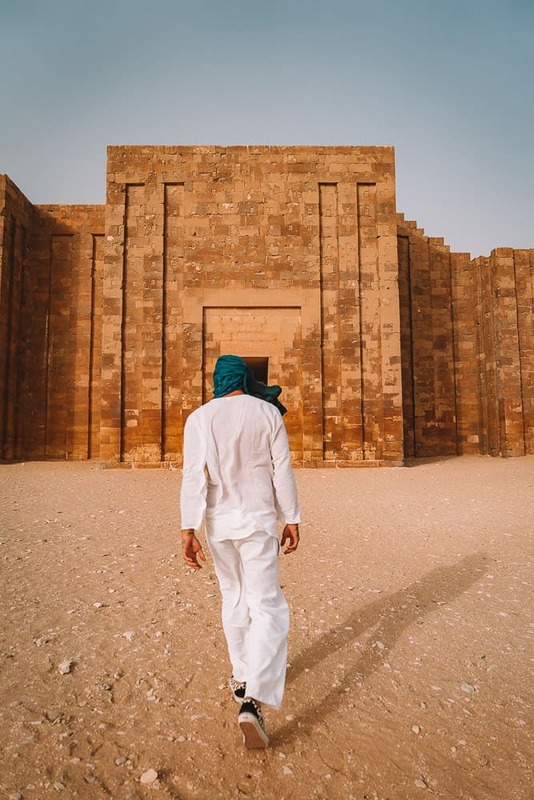 From Abu Simbel, the Travel Talk Tours squad and I jumped back on the bus and made the 3-hour return journey to Aswan to explore the island temple known as Philae. 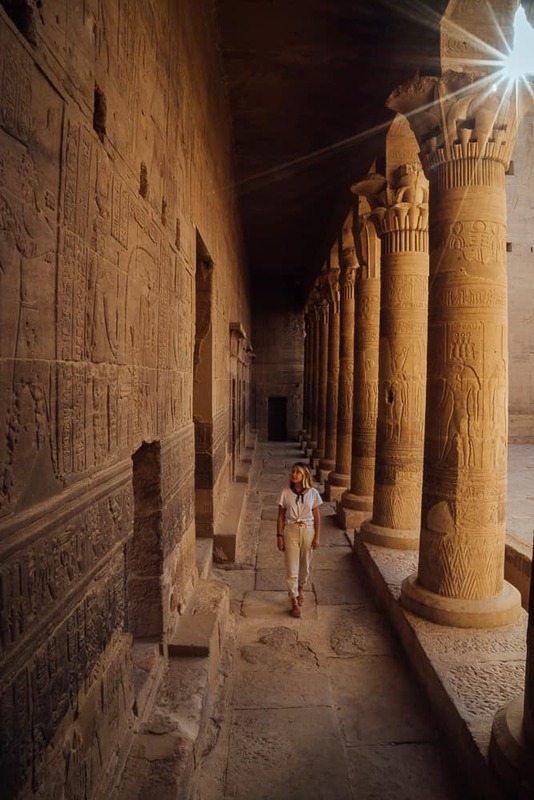 Philae Temple, also known as the Temple of Isis, is one of the best temples I visited on the 15 Day Egypt and Jordan Tour. 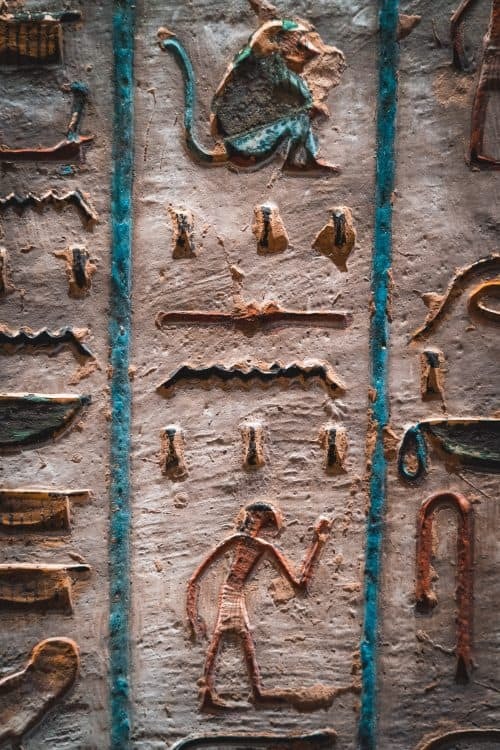 Only accessible by boat, this island temple features a mix of courtyards, high walls, pylon structures, rubbled terraces and ancient hieroglyphic carvings. 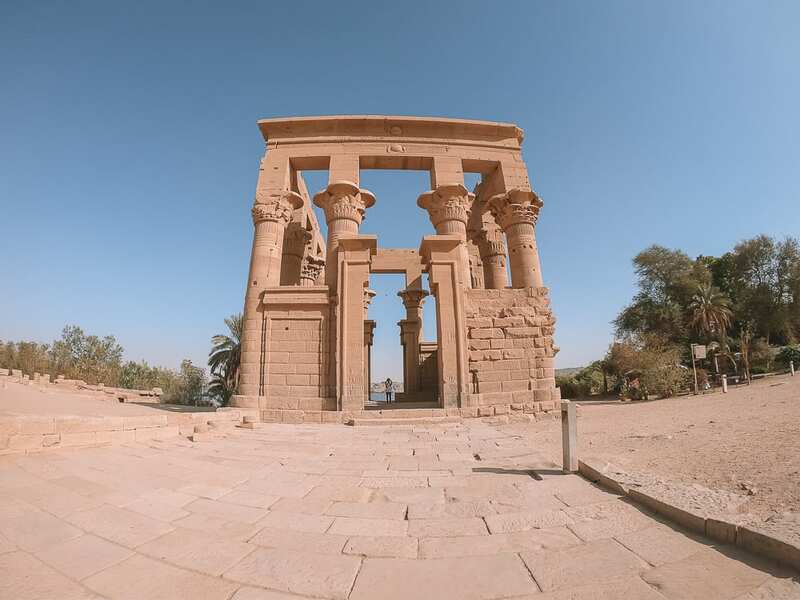 Philae Temple, built in 690 AD, is dedicated to the goddess Isis and the temple serves as an example of the cult that was built around her story which also includes Osiris and Horus. 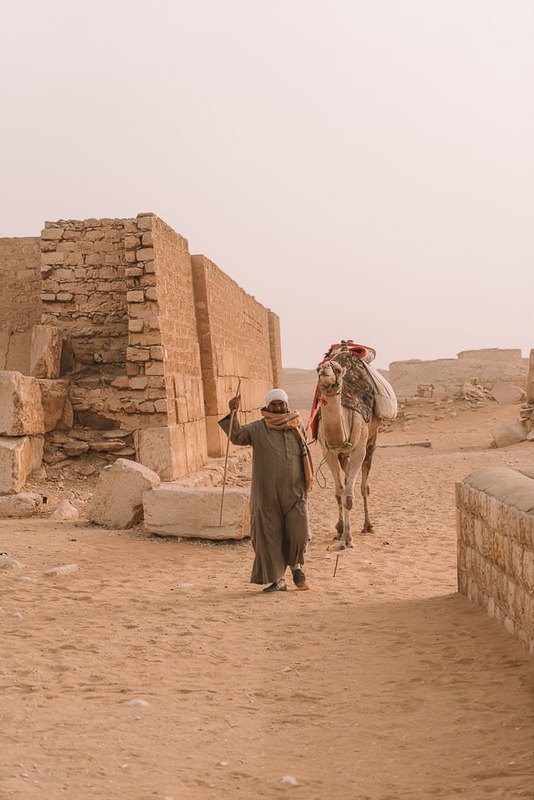 After a long day of temple hopping, we returned to the hotel in Aswan briefly to get ready for the 2-nights and 1-day Felucca cruise on the Nile River. 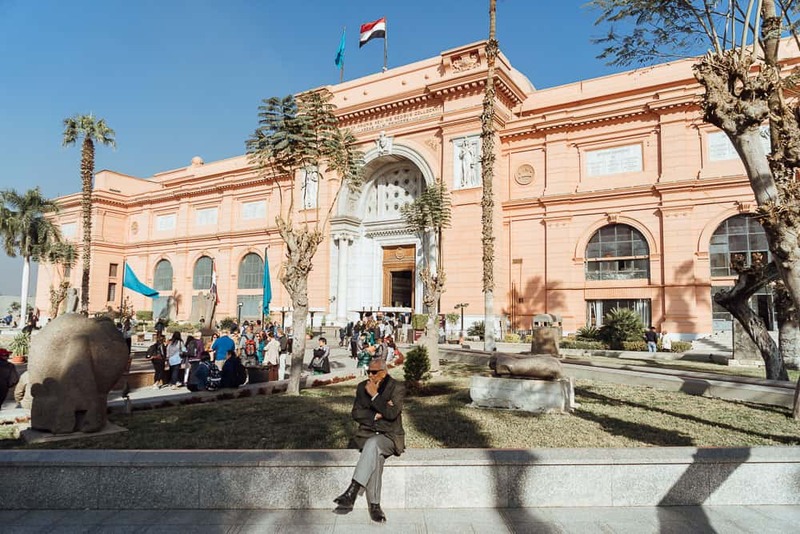 A short walk across the street to the pier to board the Felucca and we were off with the wind down the Nile as the sun began to set over the horizon. The boat operators are local Nubian’s that took care of us over the 2-day Felucca adventure. They cooked up a traditional style dinner and we enjoyed the night listening to tunes, drinking beers and smoking the flavoured tobacco sheesha! Another early rise as the sun peeped through the curtains of the Felucca. For those of you who don’t know what a Felucca is, it is a traditional wooden sailing boat with one sail and no motor. They have a large open seating/sleeping area padded with cushions and blankets and a sturdy mast that holds the large canvas sail in place. We spent the day cruising ever so slowly and peacefully down the Nile as we shared stories, played cards, took photos and maxed relaxed. It was a super chill day that was much needed after zipping around to all the awesome sites over the previous 4 days. 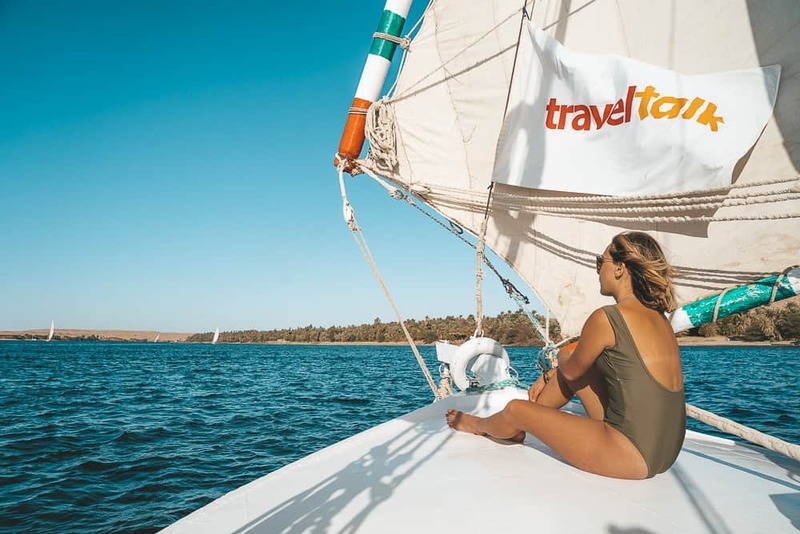 Our captain beached the boat on the edge of the Nile so we could enjoy a refreshing swim/shower in the river and sunbake on the sand. After lunch, we sailed a little further down the Nile to another spot to park up for the night. 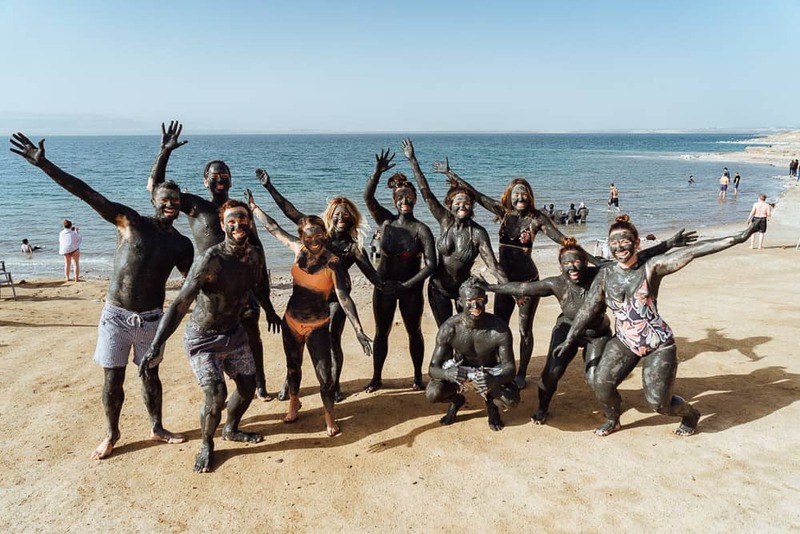 The Nubians sparked up a bonfire, pulled out their djembe drums and played some traditional Egyptian music as we all danced and chanted around the campfire. 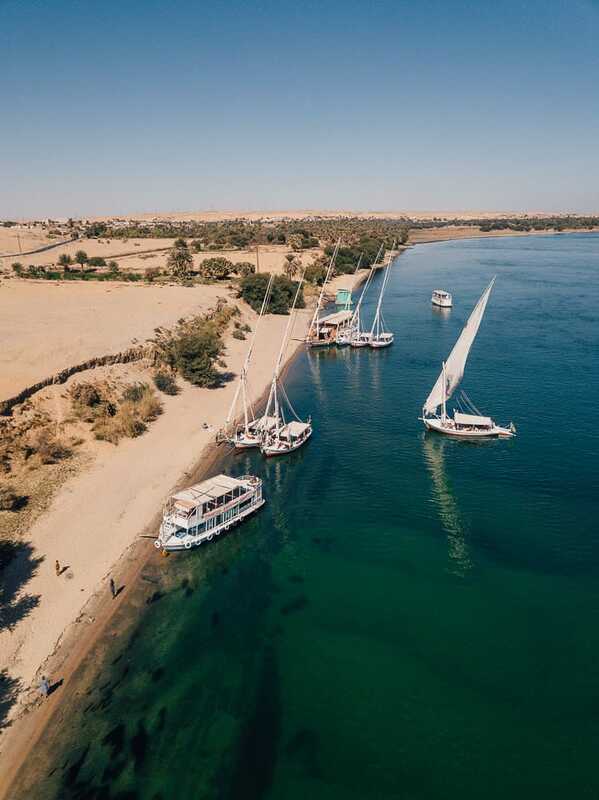 The Felucca cruise was definitely one of the biggest highlights for me on the Egypt Itinerary. 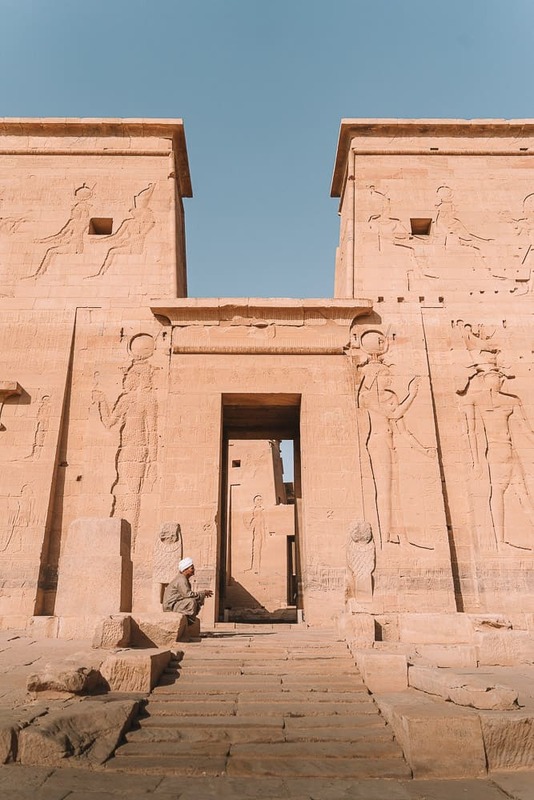 Edfu Temple is one of the best preserved archaeological sites in all of Egypt and the largest temple dedicated to the falcon god, Horus. 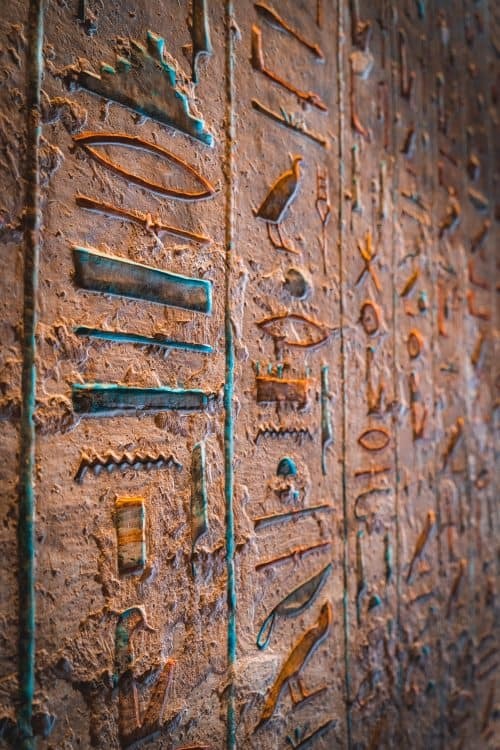 Inside the walls of the Edfu Temple are hieroglyphic inscriptions and scenes which contains important information on language, myth and religion during ancient Egyptian times. We were all given some free time in the afternoon to chill at the hotel in Luxor before visiting the Luxor Temple by night. 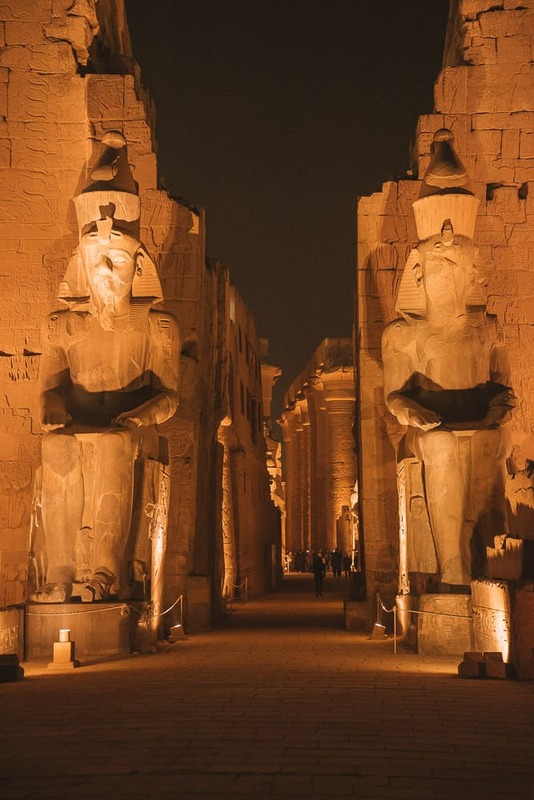 Unlike most temples in Egypt, the Luxor Temple is not dedicated to a cult god but instead dedicated to the rejuvenation of kingship where many Egyptian Kings were crowned. 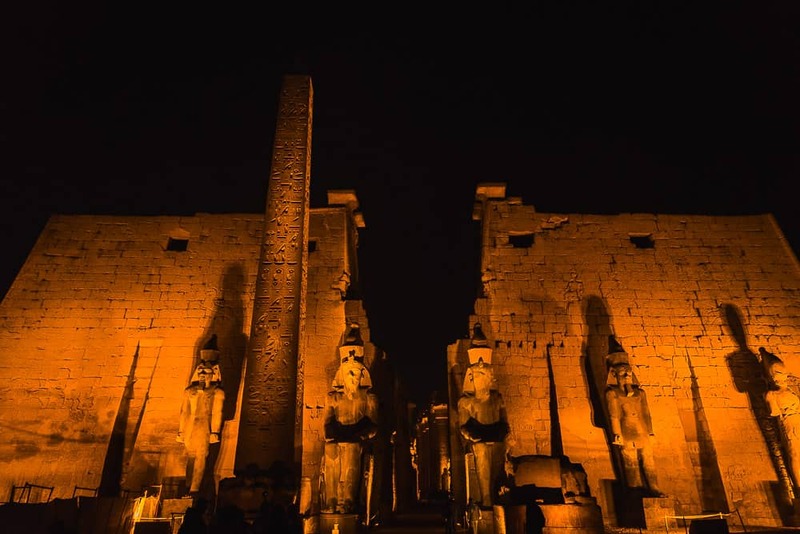 Exploring the Luxor Temple by night was incredible. 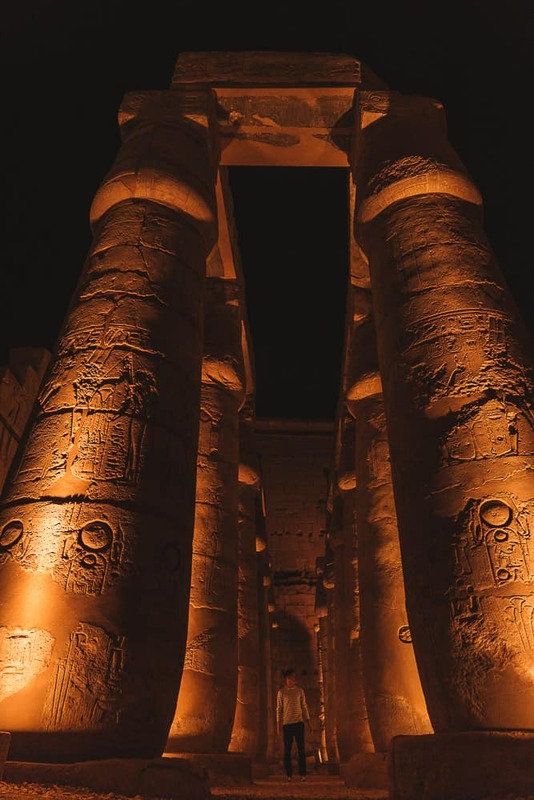 You can’t miss the hypostyle courtyard at the back with enormous pylons illuminated by light! 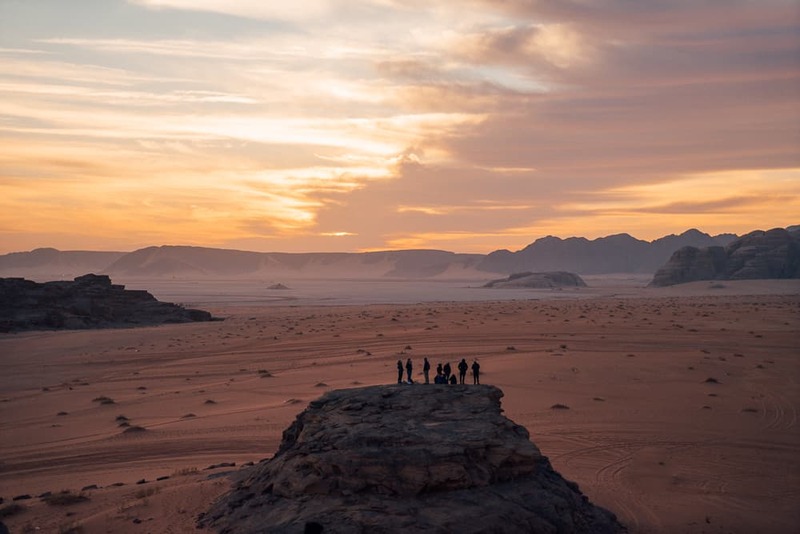 A sunrise hot air balloon flight was planned on Day 7 of the Egypt and Jordan tour but unfortunately, due to unsuitable weather conditions, we weren’t able to take flight. After a buffet breakfast, we checked out of the hotel and made our way to the Temple of Hatshepsut at Deir El-Bahri. 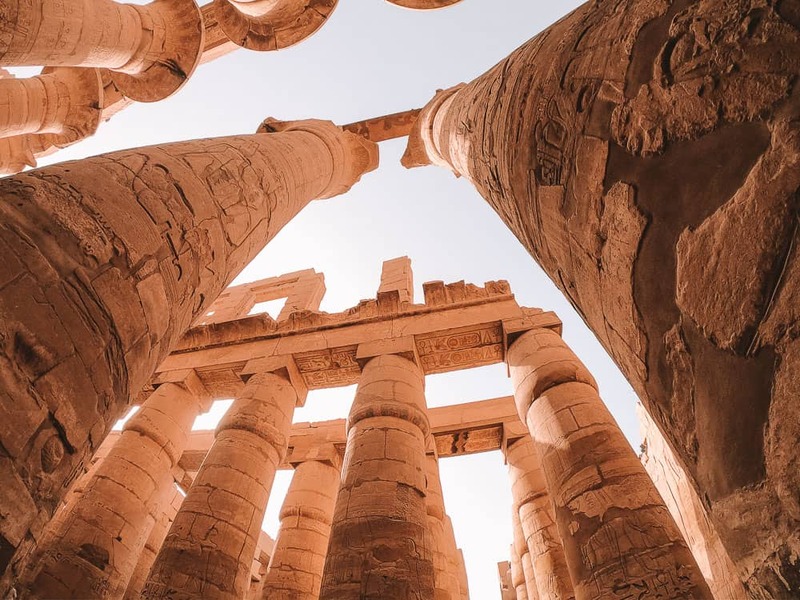 This temple is one of the most distinctive temples in Egypt which is made from limestone, not sandstone. 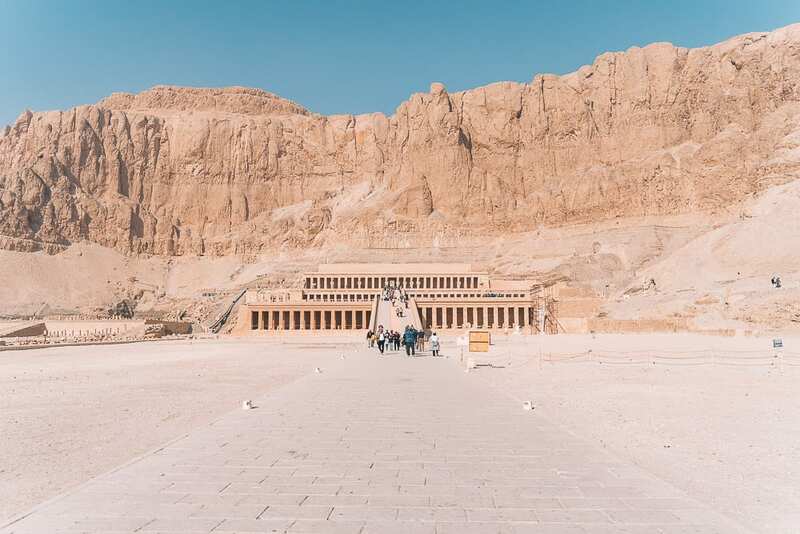 It was built to commemorate the achievements of Queen Hatshepsut as well as a sanctuary of the god Amon Ra. 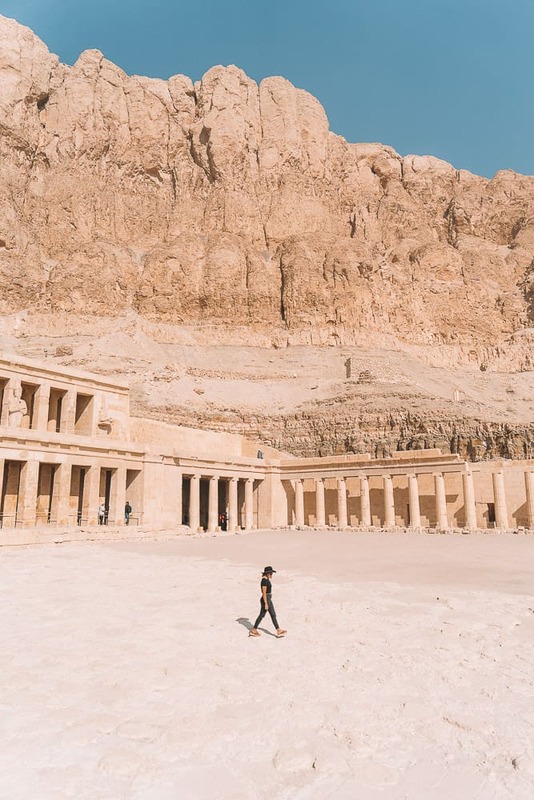 Hatshepsut Temple is situated at the end of a rocky valley and behind it is a mountainous backdrop known as the Peak of Thebes. The temple is a 3-tiered structure joined by long ramps and a panoramic viewpoint of the region awaits you on the highest terrace. From here we drove for a further 15-minutes to the world-famous Valley Of The Kings and the City Of The Dead. It is here where the royal tombs of all the kings and high officials were found cut into the rock valley. 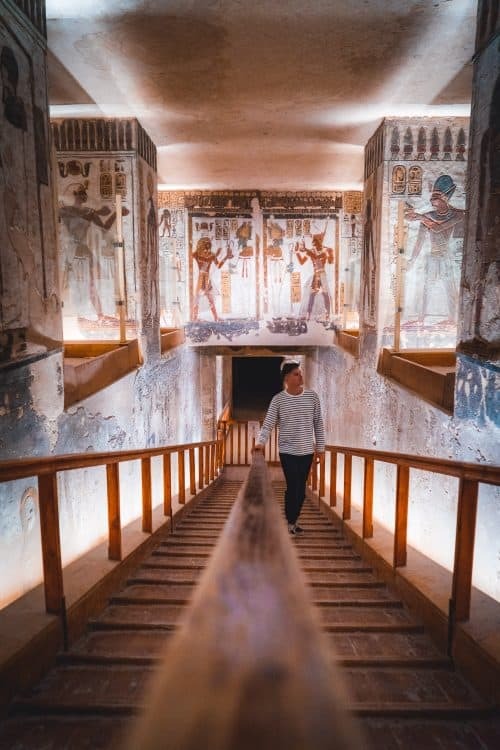 These once hidden tombs are richly decorated from top to bottom with colourful hieroglyphs, painting a story of ancient Egyptian times. 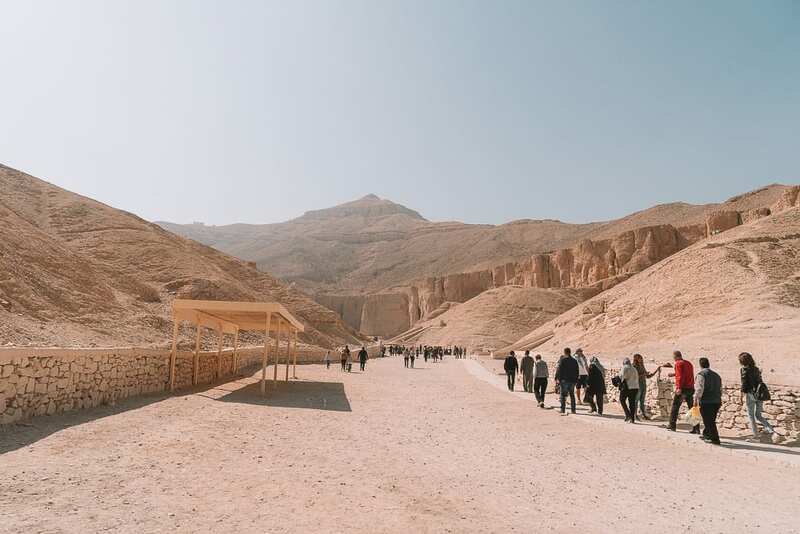 It was so surreal walking through the Valley of the Kings, hopping between the royal tombs and it is an experience that I will never forget! After a couple hours exploring the Valley of the Kings, we stopped into a local restaurant for a BBQ lunch before making the 10-hour bus journey back to Cairo. 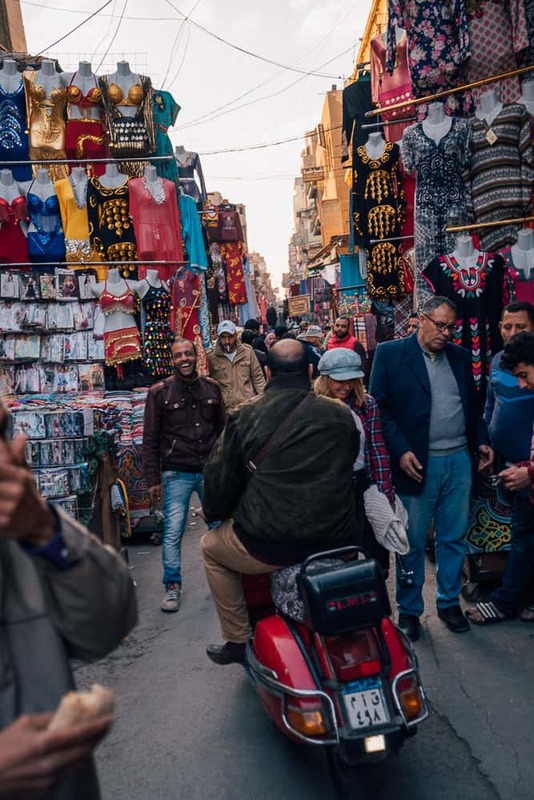 The Egypt and Jordan tour continues with a jam-packed day of sightseeing in Cairo City. 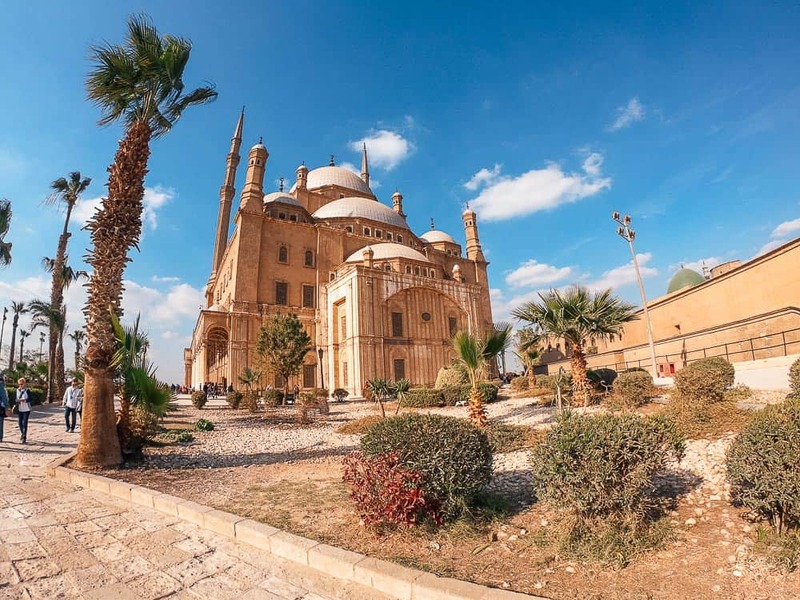 Firstly, we visited the Egyptian Museum which is one of the most important museums on the planet, holding more than 150,000 relics of Egypt, followed by the Citadel of Saladin, the Mosque of Muhammed Ali, the Hanging Church and the world famous Kahn El Khalili Bazaar. A 4am start for a 10-hour bus ride to Dahab. We finally arrived and checked in to the Dahab Paradise Hotel, located a stone’s throw away from the Red Sea. 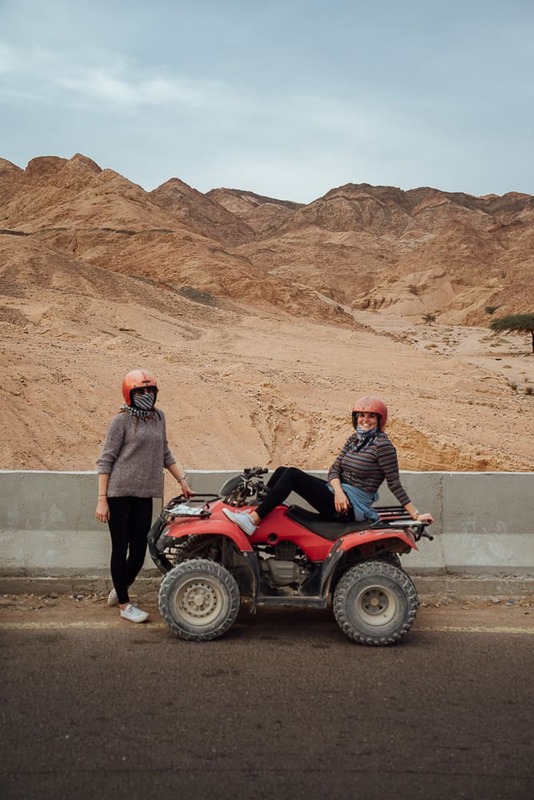 That afternoon we went on a 2-hour ATV adventure in the outskirts of Dahab. 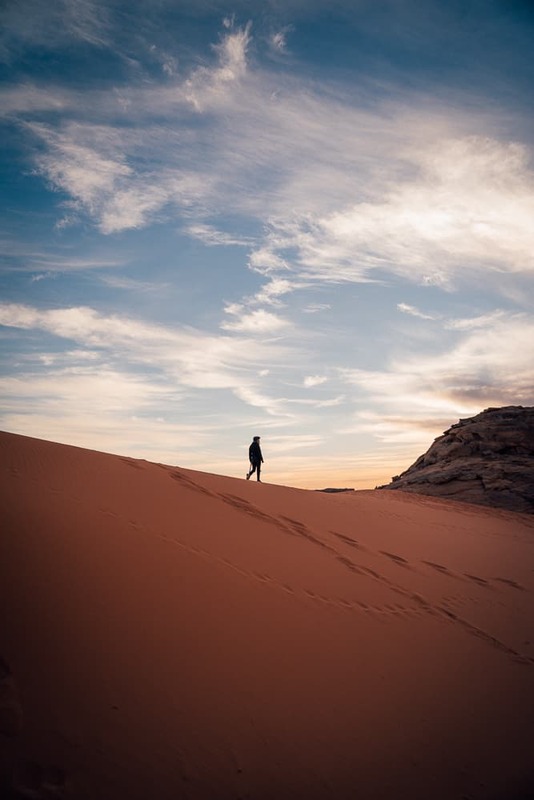 It was such a buzz convoying through the desert like landscape, leaving a cloud of dust behind us. We stopped into a desert camp surrounded by rocky mountains and hiked for 10-minutes to a small peak to watch the sunset. I was blown away at the sight of this crazy and unique landscape, boasting enormous cliffs right on the edge of the Red Sea. 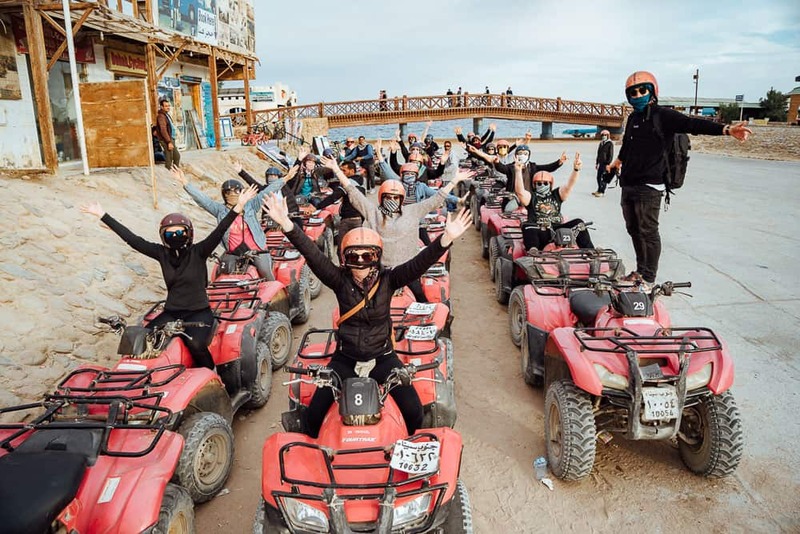 After an epic afternoon on the ATV’s, we headed back to Dahab Paradise Hotel for dinner and drinks around the campfire. 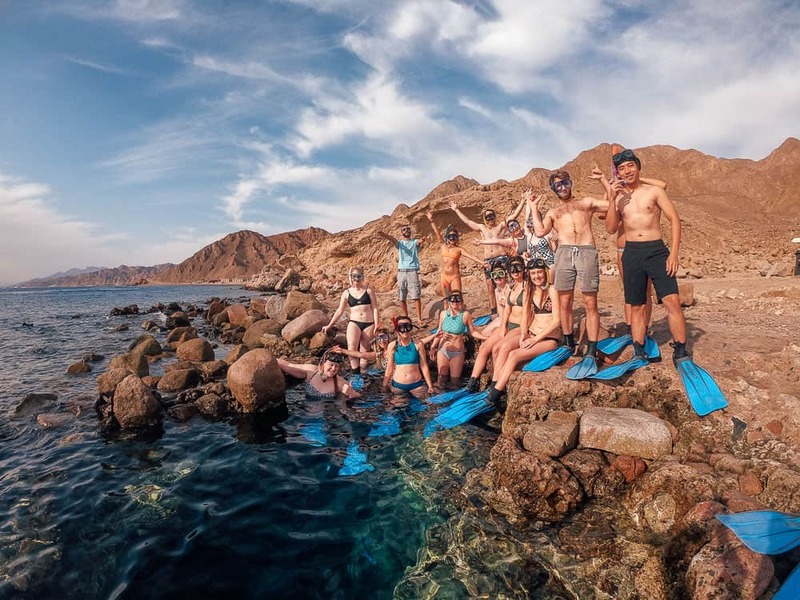 On our second day in Dahab, we geared up to go snorkelling at the famous Blue Hole snorkelling/diving site, just 10-minutes drive from the hotel. The water clarity at this specific location in the Red Sea is the clearest water that I have ever seen in my life! 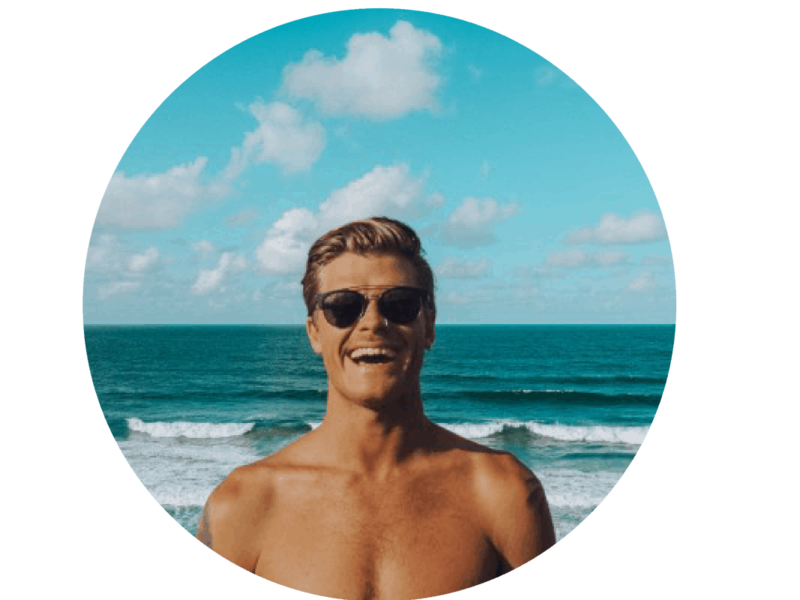 Besides the insane clarity, there is a coral rock wall drop off as soon as you step into the ocean, which is home to an abundance of brightly coloured fish and other fascinating sea creatures. I could have easily spent hours hanging out underwater here at the Blue Hole but it was time to head back to the hotel for lunch. 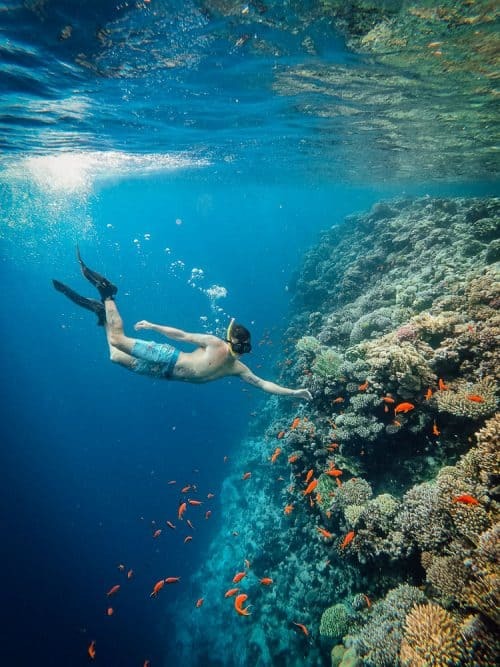 For the scuba diving enthusiasts, beginner to advanced, there is the option to spend the afternoon diving in the Red Sea. 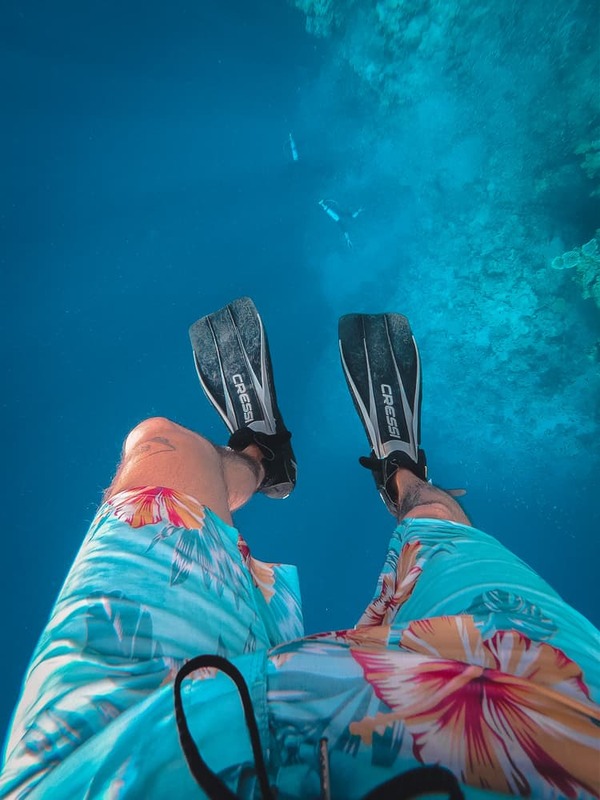 I personally didn’t go diving as I have had an ear injury in the past but the others said it was the best diving experience they have ever had! That evening, we drove 30-minutes into the desert to have a traditional Bedouin dinner by a blazing campfire. The moon was full and the stars blanketed the sky as we chowed down on a delicious feast followed by a drumming performance and some party games. It was time to say goodbye to our Egypt guide, Mustafa and we headed to Nuweibaa Port to take the ferry across to Aqaba Port, Jordan. The ferry transit took quite a while and we didn’t arrive in Jordan until 5pm. Unfortunately, my drone camera was picked up by customs security at Aqaba Port and confiscated after I was interrogated for 3 hours. So if you have a drone camera I would leave it at home for this trip. 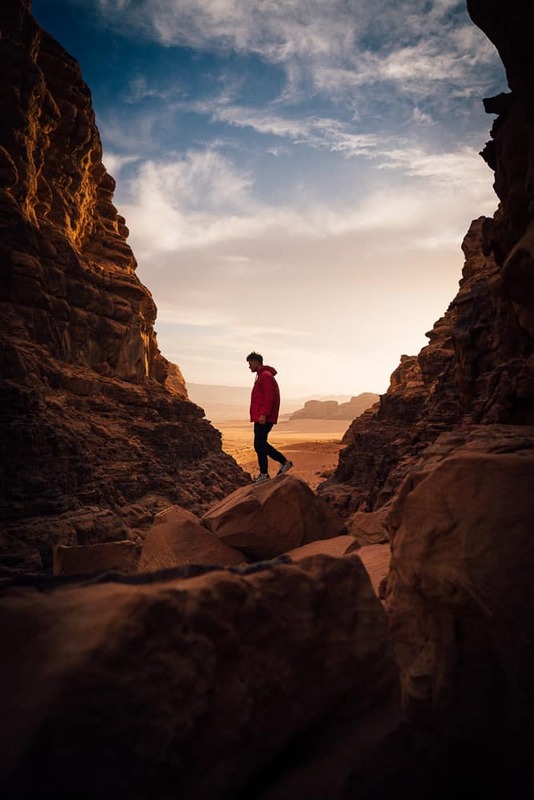 We met with our Jordan travel guide, Faisal, who was waiting for us at the port and we hopped on the bus for a 1-hour drive to Wadi Rum for the night. We arrived quite late to the desert camp, so it was a quick dinner and then straight to bed. 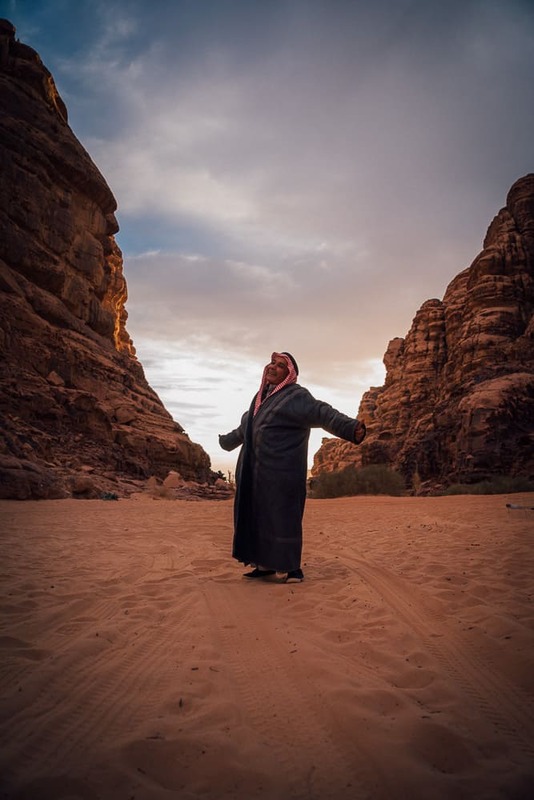 After a cozy night in the desert camp tents, we were up at the crack of dawn for a sunrise jeep adventure through the Wadi Rum desert, which was one of the best things we did on the Egypt and Jordan Tour. 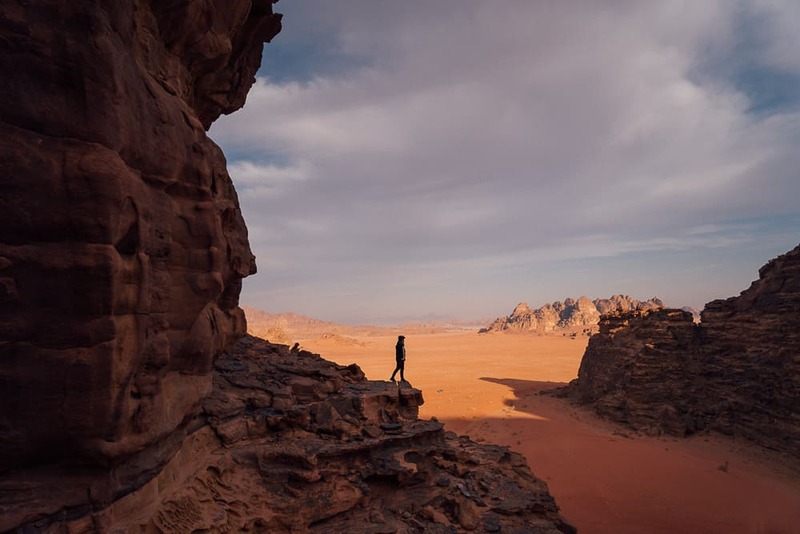 I have three words to describe Wadi Rum – Vast, Echoing and Mars-like. We spent two hours cruising around this other-worldly landscape, stopping at several spots to explore and take photos. I was in complete awe the entire time, gazing up at the monolithic rocks that surrounded us. 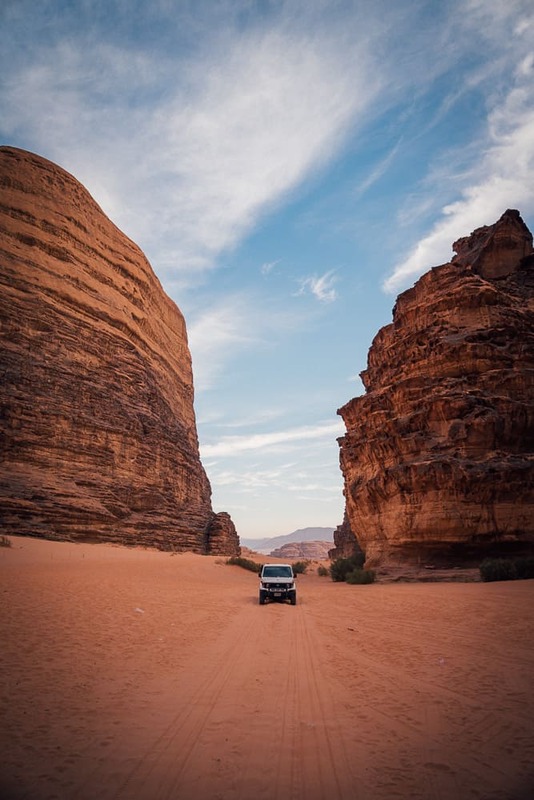 I wish we had more time here in Wadi Rum but we had to head back to the desert camp for a big breakfast before making the 2-hour bus journey to Petra. 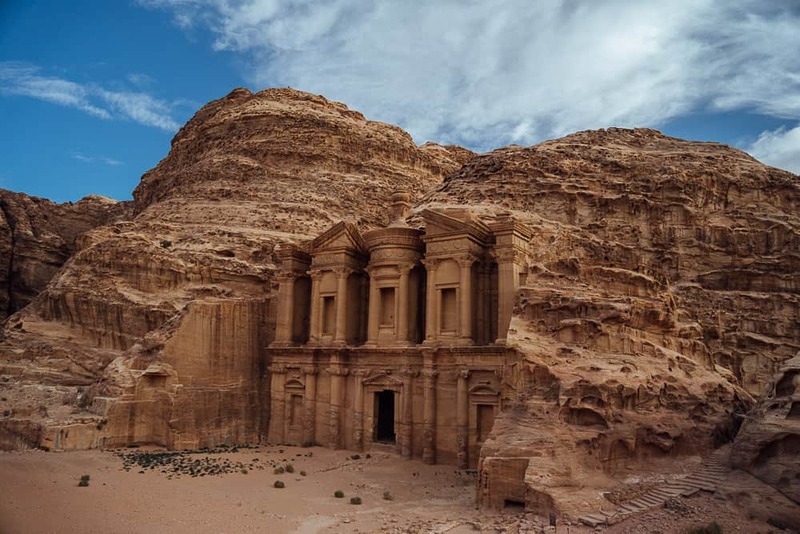 We arrived in Petra around midday, dropped our bags at the hotel and we headed straight to visit the City Of Mysteries! I had been dying to see this place for years and today was a dream come true! 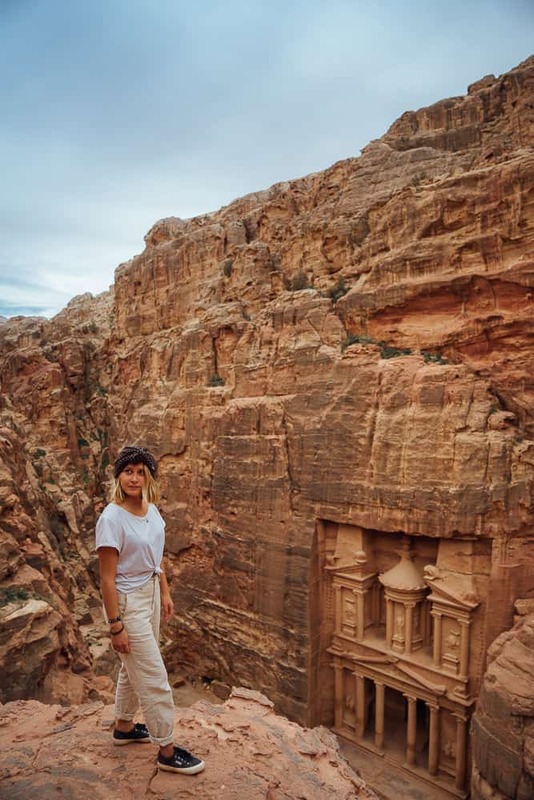 Anything you have ever read or seen on movies about Petra doesn’t compare to seeing it in real life! 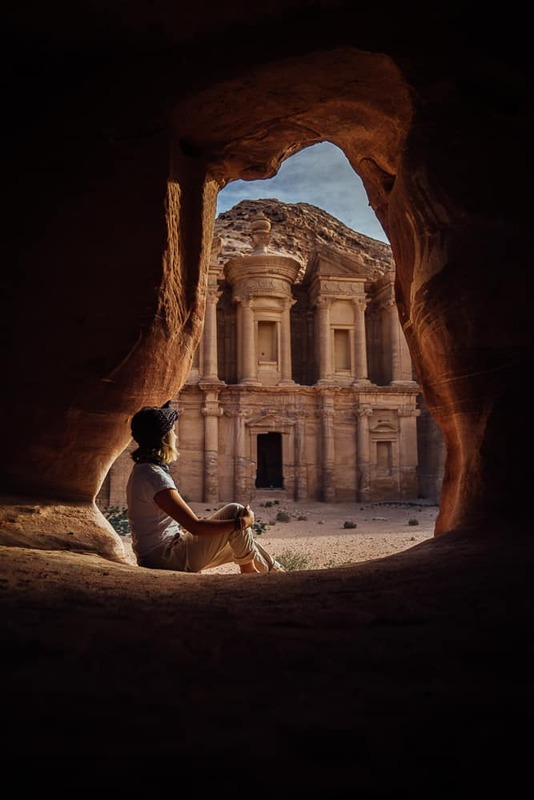 This unique city is the biggest draw for tourists visiting Jordan and it is easy to see why. 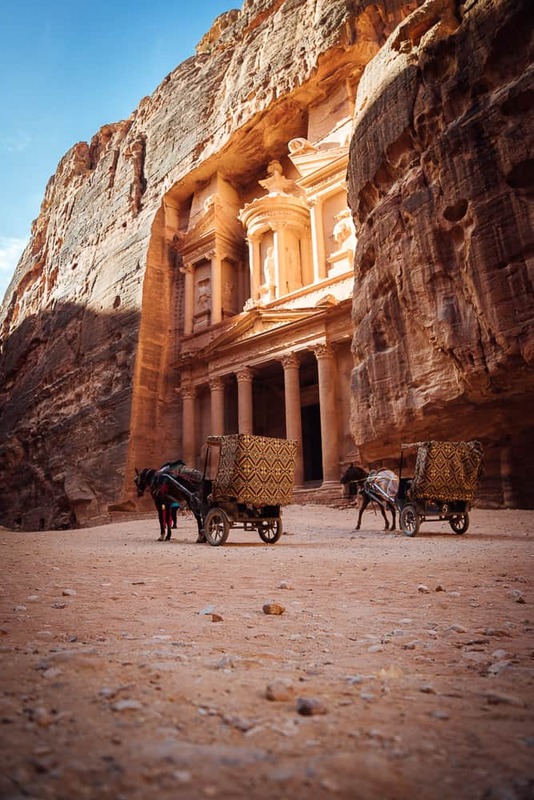 Petra is one of the 7 World Wonders and it is also a UNESCO World Heritage Site! We spent the entire afternoon and evening getting lost inside the City Of Mysteries and admiring all the epic rock-carved temples, especially The Treasury! It is hard to believe that these temples were carved from the top down over 2000 years ago… Sounds very mysterious to me! 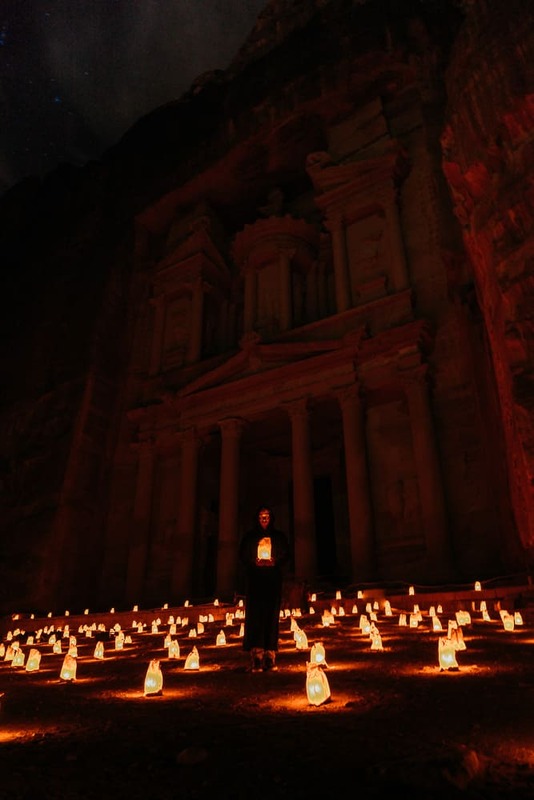 The Lost City Of Petra by night is one of the best experiences I have ever had. A candlelit path leads all the way down to The Treasury for a 2-hour light show and music performance from the local Jordanians! It was sad to leave Petra but it was time to make our way to Amman for the last leg of our 15 Day Egypt and Jordan Tour. On the way to Amman, we made a quick stop into the Kerak Castle, an old crusader castle built in the 12th century. We then continued to Amman, arriving at the hotel around 5pm. On our second day in Amman, we spent the morning checking out the downtown market and the citadel before making our way to the Dead Sea, which is a one hour drive from the city. 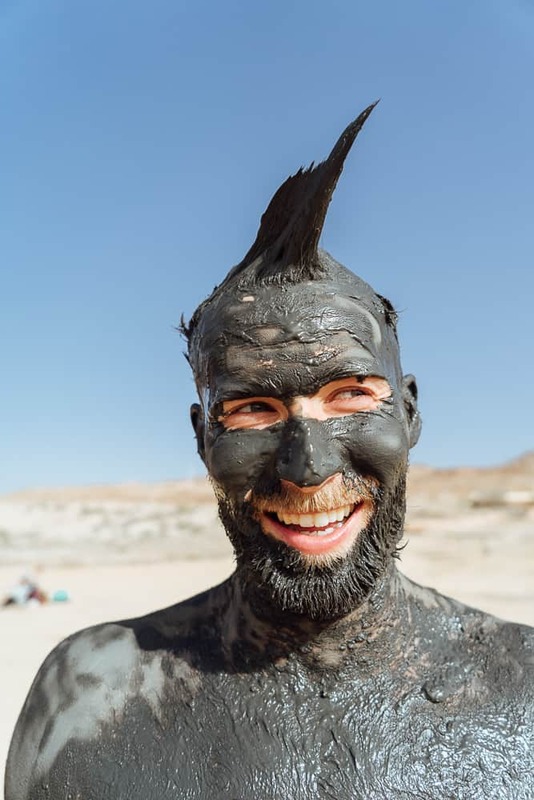 The Dead Sea was really something else! It happens to be the lowest point on earth at 400m below sea level. 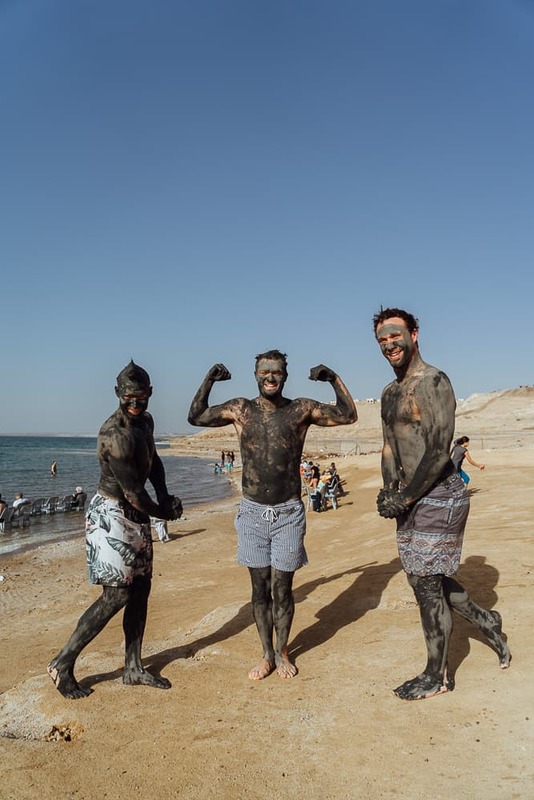 The high salinity levels in the Dead Sea make it very easy to float and in fact, it is near impossible to sink. There is no life in the Dead Sea and it is one of the world’s saltiest bodies of water. We spent a few hours bobbing around in the hypersaline beach, enjoying our last day on tour! Unfortunately, it was time to say our goodbye’s to the Travel Talk Tours squad and continue our travels to the next destination! This was my first ever organised group tour I have ever been on and it highly exceeded expectations. 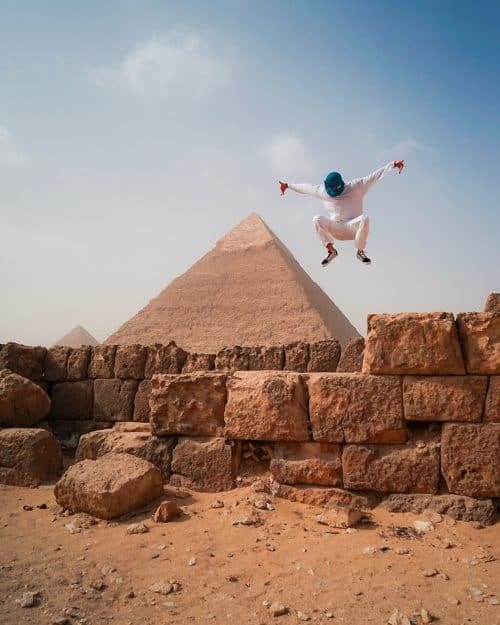 If you want to do this exact same 15 Day Egypt and Jordan Tour, click HERE to check availability and rates! I hope you enjoyed reading this article and if you have any questions at all, please leave me a comment below! Great read Jonny. Thanks for sharing your experience with us. Makes me want to visit sooner than later. Hey Amanda, glad you love the article! 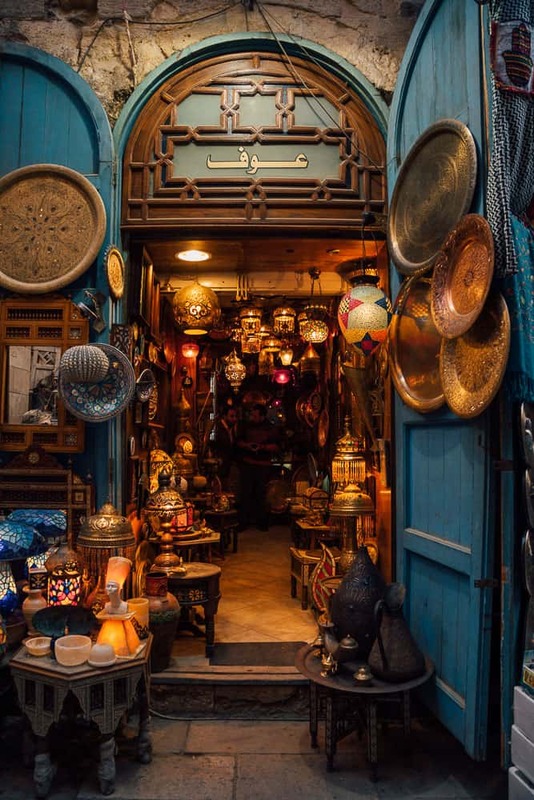 Have a great time in Egypt and Jordan when you get the chance to visit! I loved reading your post. Your pictures are amazing and gives me a sense of being there. 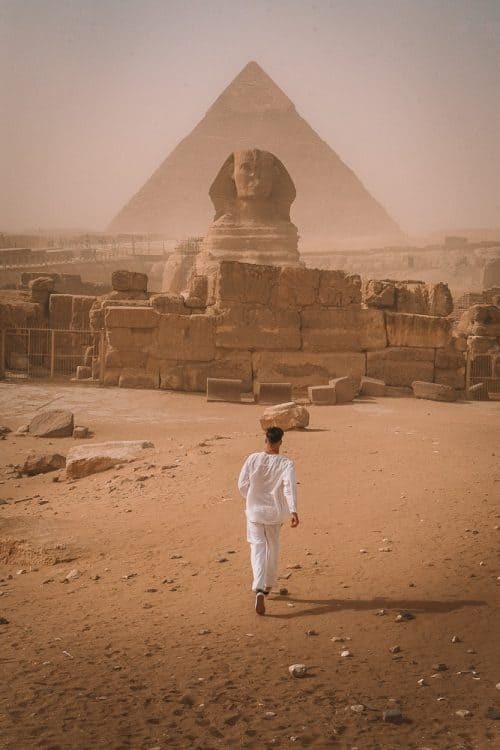 Egypt is high on my bucket list and I hope to visit in the near future. Keep up the great writing! Hey Karen, stoked you loved the read! You must visit for sure, it was absolutely incredible! Enjoy. 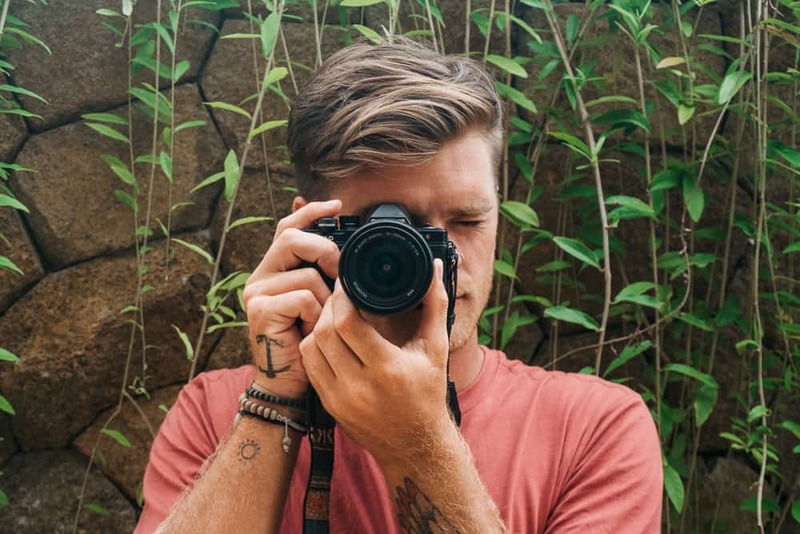 Glad you love the photos and blog! Yes all information is in the article including the tour company I went with. Just click on the links to check them out!